Investment in a stable committed workforce has always been core to the Health Center Movement and mission. NACHC is a national leader investing in the health center workforce and is engaged in a long-term strategy to secure a primary care workforce that meets the needs of America’s Health Centers and their patients. 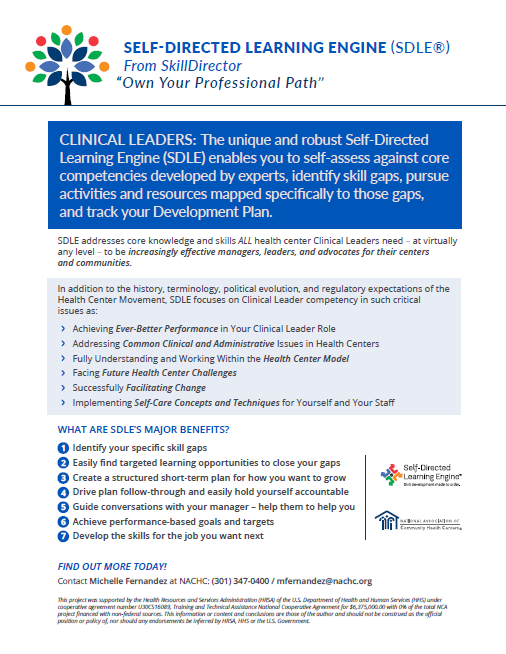 NACHC works with SkillDirector on the Self-Directed Learning Engine (SDLE). 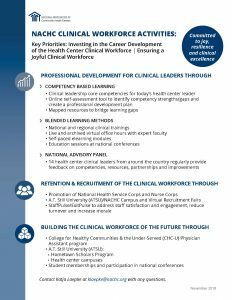 Clinicians use this tool to assess their professional competencies as a clinical leader across 10 domains, identify their learning gaps, and create a Development Plan to bridge their gaps over time through vetted and recommended resource and training opportunities. The Clinical Leadership Development Self-Assessment can be taken at multiple intervals for regular re-assessment, especially post-trainings. Currently, licenses are only given with enrollment in specific trainings or through Primary Care Associations (PCAs). However, licenses will soon be available. NACHC’s Training for New Clinical Directors provides the core knowledge and competencies that all health center Clinical Directors need to function as effective leaders, advocates, and managers for their health centers and communities. Learn more. NACHC offers four Managing Ambulatory Health Care (MAHC) training courses that go beyond the basics of being a new Clinical Director in a health center. MAHC 3 and 4 offer the opportunity for clinical and administrative leaders at a health center to learn together. NACHC was part of the founding of this educational entity solely committed to responding to the needs of health centers. More than 20 health centers are currently working on a Physician Assistant (PA) program by embedding five second year PA students each year. NACHC produces resources and offers technical assistance to provide comprehensive guidance on deeming of health center volunteer health professionals to help serve as a recruitment tool for clinicians who may be unsure of their responsibility. Learn more. Currently, there are 25 Community Campuses. Students gain hands on experience as they are placed in medically underserved areas in community health centers for three of their four years of training. Physician’s Assistant program (Arizona School of Health Sciences, ASHS), where students receive coursework specifically geared toward community-oriented care excellence. NACHC supports this annual event specifically reserved for health centers and Primary Care Associations held at one of the ATSU osteopathic medicine university campuses. The Urban Service Track program addresses the shortage of primary care health care providers in urban and underserved communities. Students from six disciplines spend two years training through service learning and clinical experiences at health centers and other primary care facilities in Connecticut’s urban underserved communities. A key component of UST’s leadership and advocacy training is attendance at NACHC’s annual Policy & Issues (P&I) Forum. Since 2007, UST has supported more than 100 students to attend the P&I. Students are selected through a competitive application process. Once selected these Urban Health Scholars participate in an advocacy information session which includes a “Community Health Center 101” introduction and in-person meeting with members of Connecticut’s Community Health Center delegation. As part of the P&I, Urban Health Scholars participate in plenary and workshop sessions, as well as the Young Health Professional and LGBT receptions. 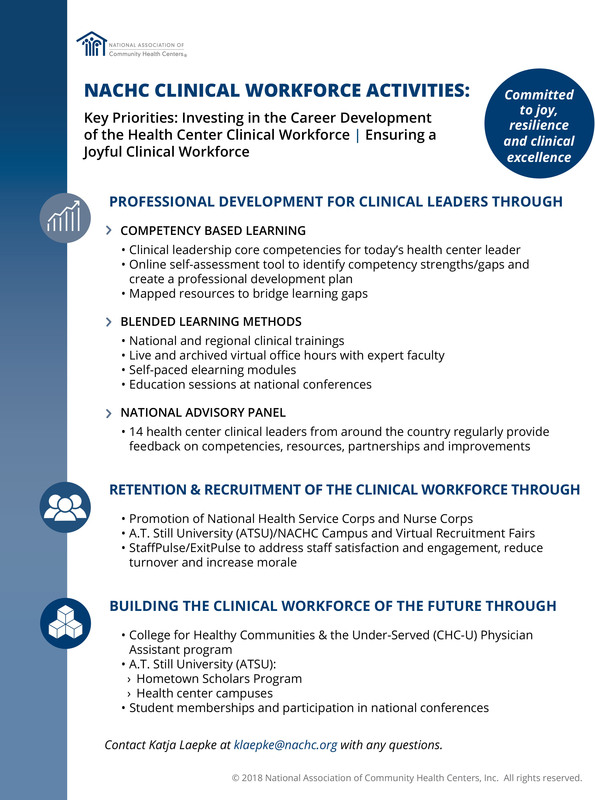 NACHC supports the National Medical Fellowships Primary Care Leadership Program (PCLP) which seeks to build the pipeline of primary care professionals from diverse backgrounds. The competitive process attracts qualified students with a demonstrated commitment to serving underserved populations. In the six week summer program, scholars complete 200 service hours at a health center. They participate in clinical rotations and care delivery, receive leadership training, and develop and execute service-learning projects. Contact Katja Laepke with any questions.